This XA92 console receiver was produced in Mauritius in 1942. Murphy exported completed table models and chassis to be fitted into locally manufactured radiogram & console cabinets. Q: What is an Englishman's favourite topic of conversation? Murphy Radios manufactured for export meeting these exacting specifications bore the prefix 'T'. Some export receivers bore the prefix 'S' - standing for semi-tropicalised. This latter category includes the SAD94S & SAD94L. Both of these were readily available for domestic use; it's all rather confusing really. I don't know quite what the difference was between 'S' and 'T' - I would guess that it was a case that the fine men in engineering had not done the research to be able to guarantee the fully tropicalised specification at the time. This trade must have proved reasonably lucrative as in 1946 a special version of 'The Murphy News' catchily entitled 'The Overseas Murphy News' was introduced (do you have any copies of 'Overseas Murphy News'? I only have one issue and I would love to see some more!). Service information for these models wasn't routinely circulated to UK Murphy Dealers, so this information is very difficult to obtain. Some Murphys were intended for export Europe. At least one of these, the EU102 bore the prefix 'E'. The EU102 is based on the U102 but with provision for 110v mains operation. Murphy radios were available for sale in Ireland from fairly early in company's history. I assume that there were dealerships appointed. The 'Murphy News' often quotes 'Eire prices' for many of the models. The snag for any company exporting is that of import duty. Such goods tend to be more expensive than the local product. Many of the big names radio made sets in Ireland so Murphy was at a disadvantage. This situation was addressed in 1949 and a factory was established in Dublin. Even easier than building a factory, get someone else to make your radios for you! 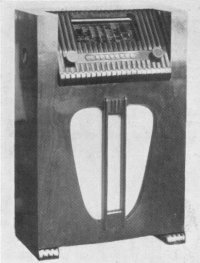 At some time after the War, Murphy licensed the manufacture of their radios in New Zealand to Westco Products Ltd. Westco, (formerly Westonhouse Radio Ltd.) specialized in manufacturing radios for third parties… The Murphys made in their Auckland factory were standard Murphy export models. This relationship ceased in 1956 and Westco went out of business shortly after. The license to manufacture radios under the Murphy name passed to Allied Industries Ltd. - a subsidiary company of Fisher & Paykell who were to distribute the radios. The latter company had previously imported and distributed radios of the 'Pilot' brand. 'Allied' Murphys were more suited to the NZ market and bore only passing resemblance to UK models. They often used obsolete UK cabinet designs (e.g. the U198 cabinet is reborn as the M101 'Magna').